Dr Toby Hall trained in radiology at St George’s Hospital in London with subsequent specialist training in oncological radiology at The Royal Marsden Hospital in London and Surrey. He was appointed as a consultant in Bath in 2001. His major clinical interests are in oncological and chest radiology and he has led the development of CT coronary angiography and cardiac MRI in Bath. 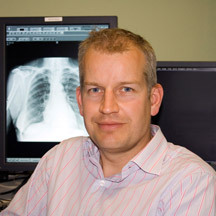 He is an expert panel member for the Royal College of Radiologists ‘Making the Best Use of Clinical Radiology Services’ publications, department lead for research and development and for the South West Radiologists Association, hospital lead for clinical work experience and an examiner for University of Bristol Medical School.